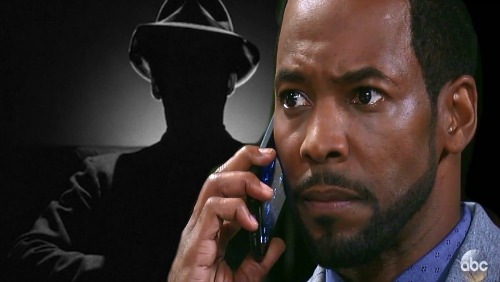 General Hospital (GH) spoilers tease that Andre (Anthony Montgomery) will find himself in a tight spot. Patient Six (Steve Burton) is on the loose and Dr. Klein (Gene Farber) can’t seem to get a grip on the situation. Meanwhile, Franco’s (Roger Howarth) obsession with Jason’s (Billy Miller) twin is growing. None of that’s good news for Andre, who could end up in hot water with his boss. Just who does Andre work for? There are some interesting options to consider. General Hospital spoilers suggest that some shockers are coming down the road. The identity of this head honcho is sure to be a big surprise. Let’s mull over a few possibilities that would shake things up. First, let’s talk about Victor Cassadine (Thaao Penghlis). He has Russian ties and was involved in the cryogenic clinic storyline. Perhaps Victor is back from the dead for another round of chaos. Soap Opera Digest had an intriguing blind item a while back. It noted that one actor was approached about reprising his role on another daytime drama, but his current soap said no. Thaao Penghlis plays Andre DiMera on Days of Our Lives, so that would fit here. Days wouldn’t want to let Penghlis help out a competitor right now and Ron Carlivati sure wouldn’t be helping General Hospital! That’d be a bad idea when DOOL is finally making some progress in the ratings department. If Victor is indeed Andre’s boss, that probably means GH would have to recast. It’s also possible that they wanted Victor to be the mastermind, but chose to go in another direction since Penghlis wasn’t available. In that case, Cesar Faison (Anders Hove) might be the culprit. When bad stuff happens, it’s always wise to include Faison as an option! This kind of scheme would be right up his alley. It would also explain why Andre tried to keep Anna (Finola Hughes) in his orbit. Maybe that was a little side job for Faison’s minion. He may have wanted Andre to monitor Anna’s activities. Along with some Anna spying, Andre might’ve been tasked with making sure Jason’s loved ones remained in the dark. He may be taking on more duties since Patient Six bolted and showed up in Port Charles. Although Valentin (James Patrick Stuart) seems pretty busy with other storylines, he’s another villain who should never be dismissed. No one knows what he’s up to on any given day. Finally, there’s Helena Cassadine (Constance Towers). When Jason’s involved, Helena usually is as well. General Hospital could easily bring Helena back from the dead for a new arc. They could have her return one last time to put all of this to rest. Who do you think Andre is working for? What kind of mess has this mastermind cooked up? We’ll give you updates as other GH details emerge. Stay tuned to the ABC soap and don’t forget to check CDL often for the latest General Hospital spoilers, updates and news.